My sister in law used to make this yummy jello poke cake where you transformed a regular white cake in a 9x13 pan into a yummy jello flavored treat. It was colorful and fun to look at too. Kristyn used the same idea, but transformed it into a fun patriotic layered cake that is perfect for your 4th of July celebration. If you love all of the fun red, white, and blue cakes floating around after Memorial Day, but are looking for something with a little less food coloring or a few less steps, this is the perfect alternative. A fun, patriotic dessert. 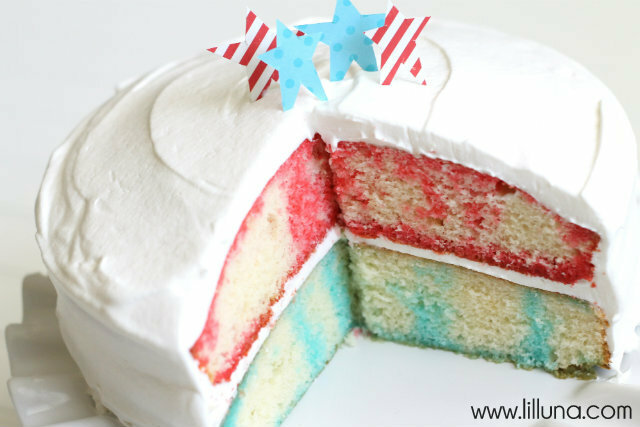 You can check out how to make your own patriotic poke cake over at Lil' Luna.